New York: HarperTorch Fiction, 2002. This is the HarperTorch paperback edition of Finding Moon. 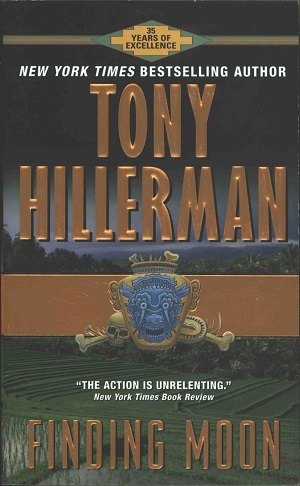 This edition was published in 2002 by HarperTorch Fiction in New York City, New York. The cover art partially replicates the cover of the first edition and was illustrated by Peter Thorpe. A new addition to the cover art is a background image of a green stepped field bordered by a forest by Ingo Tezierski/Getty Images. The cover proclaims, "NEW YORK BESTSELLING AUTHOR". Binding: Full-colored paper covers with the publishers logo, author, the phrase "35 Years of Excellence", title, and "New York Times Bestselling Author".